Ron Clark Comes to Town! Ron Clark with USA's President Tony Waldrop. So what's the big deal about Ron Clark? He has an unabashed approach to teaching children and leading teachers and a huge (yet humble) belief that he can change the world by inspiring teachers. 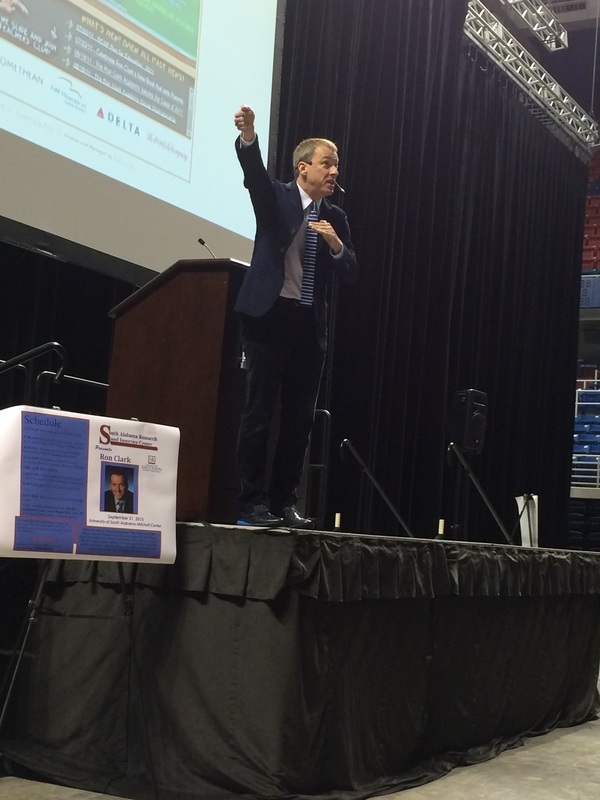 Teachers in Mobile County Public Schools and surrounding districts and students from the College of Education were treated to a live "performance" by Ron, thanks to the South Alabama Research and Inservice Center. The USA Mitchell center was filled with educators at all levels hoping to glean wisdom from this exuberant founder of the Ron Clark Academy. For two hours, the crowd laughed and applauded Ron's frank imitation of good teachers, bad teachers, and every kind in between. In his book, Move Your Bus: An Extraordinary New Approach to Accelerating Success in Work and Life, Mr. Clark describes the four types of people who either help or hinder a school faculty. Runners go above and beyond for the good of the students. Joggers do their jobs adequately without pushing themselves. Walkers are just getting pulled along. Riders hinder success and drag the team down. Ron was not afraid to tell the audience that among us are some walkers and riders. But rather than use guilt or condemnation, he motivated the group by sharing his personal experiences with colleagues and his approach to dealing with gossipy colleagues. He inspired everyone to get off your "teacher stool" and start running! The group was in for a real treat when Ron shared personal beliefs on how to teach ("keep the dust from falling on the students") and specific teaching tips from his "big bag of tricks." These include dressing in costume (I think Ron would appreciate Professor Storytime's mortarboard! ), rapping, dancing, jumping on tables and using every prop and means available to keep students engaged. Ron took the time to sign books and pose for selfies with teachers and USA students. 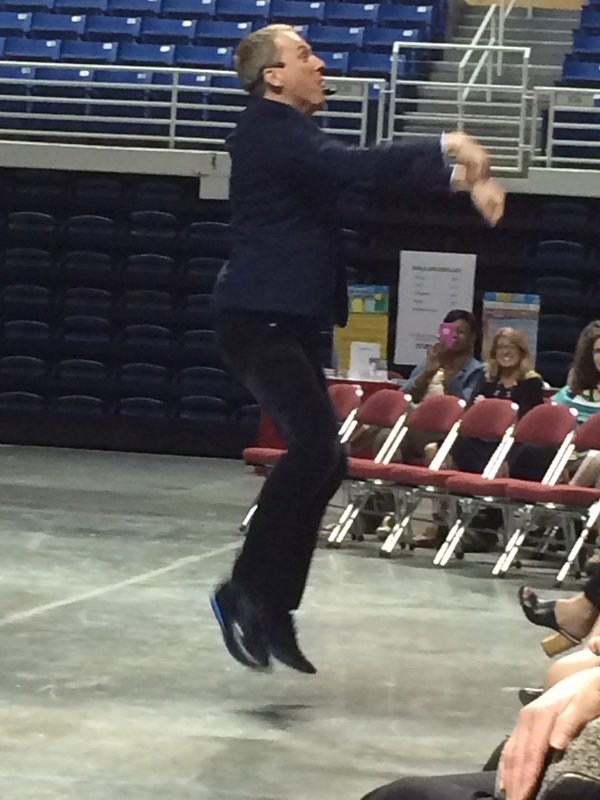 Beyond the antics and entertainment, Ron Clark delivered his message loud and clear. Our society is expecting too little from its citizens. Teachers expect too little from their students. Parents expect too little from their children. He called us out on the everybody-gets-a-trophy mentality and delivered the message that teachers have tremendous power to change the world. I like thinking about the many teachers who woke up the next morning excited about getting to school. You can almost feel the buzz of positive energy pulsating through the hallways. And their lucky students are in for the shock of their lives! 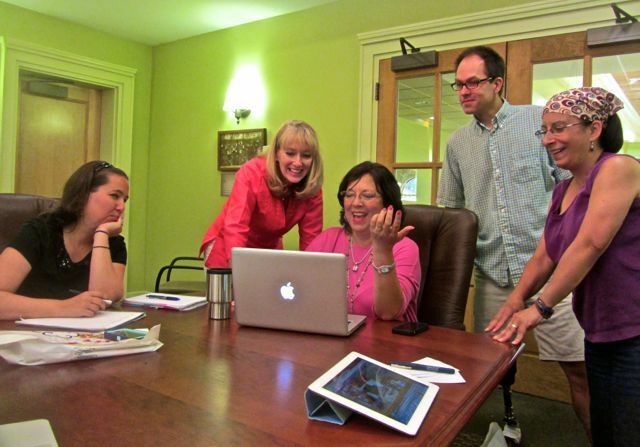 If you're an inspired teacher, please share your experience by leaving a comment! From "aye" to "poop deck," here is a fun list of words that will build children's pirate vocabulary. Looking for pirate lesson plans from K-6th grade? This link offers oodles for most subject areas including Math, Language Arts, and Social Studies and even includes apps that can be used for adaptive purposes. For crafts, snacks, books, and more idea, go to my Pinterest page, Everything Pirate-Arrr! TOUGH BORIS by Mem Fox. Picture book pirates may not be so ruthless after all. HOW I BECAME A PIRATE by Melinda Long and illustrated by David Shannon. Being a pirate can be exciting for awhile, but at the end of the day, being a kid is better. If you have a great idea to add to TLAPD, please share in a comment! An artist, a communications consultant, an editor, a photographer, a journalist, an author, a stylist, a decorator, a jewelry maker, an antique shop owner, a librarian, a cook, a recipe developer, a writer, a movie extra, a swim team mom, an etsy expert, a vocal coach, a crafter, a DIYer, a party planner, and a psychologist…What do all these people, who are many of these things, have in common? They are bloggers! Now who wouldn’t want to be a part of a group like that? Typically, we meet at a business or visit a community hot spot for the purpose of publicizing them through our blogs. For some in our group, this is a natural match for their blog. Take for example, Fairhope Supply Co. who writes about local events and people. When we visited the new coffee roasting business in town, she devoted a blog post to telling and showing readers through photos all about it. Others in our group blog about their passions, such as making jewelry at Crafty Hope, collecting and selling antiques at Coastal Charm and Judy Hanks Pimperl, or about their families at WeAreClamco. And of course Kim at Cozinest who had the idea to start this group after creating her blog about transitioning to life as an empty nester. And then there are those of us who blog very little at all. Admittedly, I fall into this last category. I’ve created two blogs with great hope and enthusiasm but both have become sadly neglected. So why keep attending meetings with bloggers when I don’t blog? It’s simply because I have grown to love the company of this unique group of people. But now, quite frankly, it’s getting a little weird. When we go around the circle to share highlights of blog-related experiences, I have nothing to add. It’s a bit like a teetotaler attending AA meetings for the coffee and donuts. My excuses for not blogging are quite reasonable. Because I spend so much time sitting in front of a computer for work, it seems my recreational time should be spent doing something completely different. Also, when I am sitting at my computer, guilt overwhelms me if I’m not spending time and brain power on a work-related project. This seemed like a pretty good excuse until I read The Happiness Project by Gretchen Rubin. Now here we have this clever attorney-turned-full time writer sharing her personal journey about pursuing happiness in her daily life. And what do you suppose she discovers that gives her fulfillment in addition to getting more sleep and reading children’s literature (truly a woman after my own heart)! That’s right. She blogs! And from the looks of her website, on a very regular basis. So if this full time author and mother of two young children can sit at the computer to blog, why shouldn’t I? This brings us to our most recent blogger meeting when Alan of Stump the Librarian suggested that I ditch both my blogs, start one under my own name and simply write about what is going on in my life. I mentioned that I already have a website under my name and that there is a blogging feature. Hmm...that got me thinking. So that brings us right back to the title, "A Blog Post about Blogging." This is my first blog post from my website so I can try it on for size. I want to find out how it works and if it has the features of a regular blog. But if I’m being completely honest, the real reason for giving this a try is so I can keep hanging out with some truly dedicated bloggers that I’ve come to admire! Here are a few members of our group meeting at the local library. 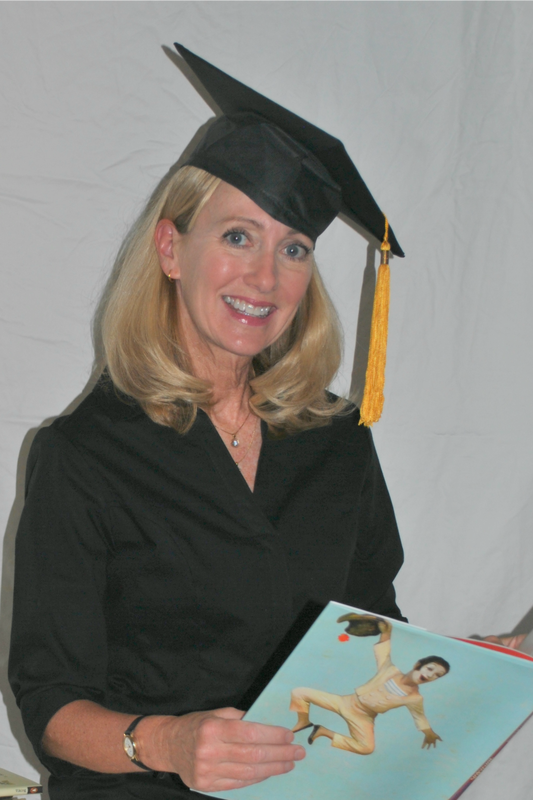 I am Karyn Tunks (aka: Professor Storytime). As an an avid reader, writer, collector, reviewer, and teacher of Children's Literature, I want to encourage young readers and writers...one story at a time.